Fixes database inaccessibility issues due to server crash, drive failures, database errors, etc. Never imaged that I could get my project information back so easily. It helped me deliver my projects on time, and saved millions for me. Thanks a lot. Kernel for Project Server is an extremely simple tool. It doesn’t have any complexities. So recovery was very easy. It didn’t take much time too. It offers two recovery modes – Raw File Recovery Mode is used when only the MDF database is corrupt and Live SQL Instance Mode is used when the Project Server is severely corrupt or down. 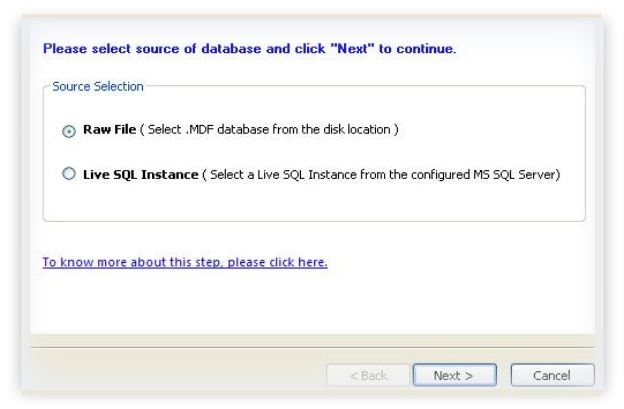 The Live SQL Instance Mode provides two options for connecting with Project Server database – through MS SQL Server or UDL File. User can choose any of the modes for connecting to the database. For saving the restored data, the tool has got two options: Save Tables or Save Documents. 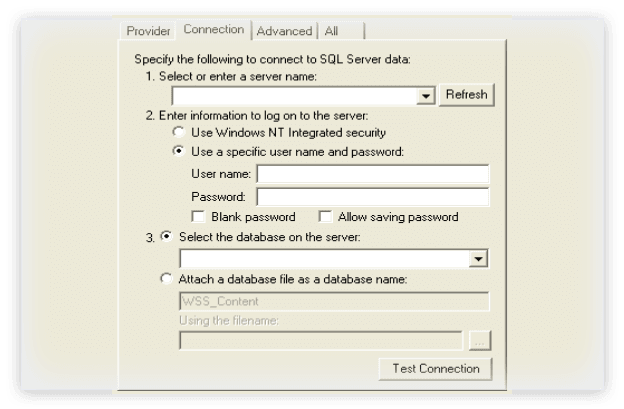 The option allows saving in SQL Server or Batch File. From the recovered data, a new MDF database can be created easily. With this tool, users can have a preview of the files after its successful recovery. One can select individual files to preview them closely. Preview facility helps users to select the required files to save them. Users can prepare a report of the extracted files and documents in HTML format. This report can be forwarded or can be saved in the desired location. Kernel for Project Server is an extremely user-friendly tool. Also, it comes with a help file. So recovery can be done even without facing any issue. SelectAt first, choose the recovery mode according to the level of corruption. PreviewIn the next step, after the successful completion of recovery procedure, the software displays the data preview. SaveIn this step, you can save the restored file using the options available in Kernel for Project Server as shown. The procedure for accessing the recovered data depends upon the selection of mode of recovery. Though I use MS Project Server comfortably, I am not technically sound. Can I use Kernel for Project Server without difficulty? Yes. Kernel for Project Server is an easy-to-use tool with only a few simple steps involved in the recovery process. So you can use it easily. My Project Server is working fine. But I am not able to access the database. What to do? This issue can easily be fixed using the Raw File mode of the Kernel for Project Server. Try it now. I feel the trial version is not working properly. What can I do now? 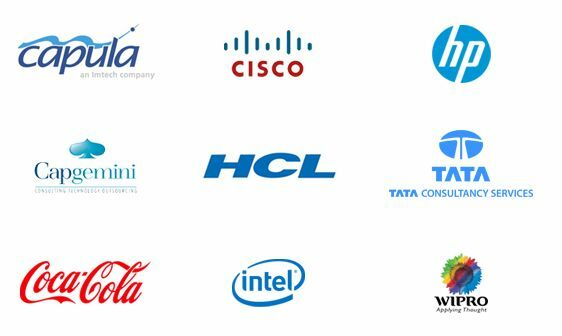 For any issue, support or query, you can contact our customer support team. Is it mandatory to purchase the full version after the trial? No. You are supposed to purchase only if you are happy with the performance of the trial version. If you think of saving the recovered data, you essentially will require the full version. Can this tool be used when the Project Server is experiencing a downtime? Yes. 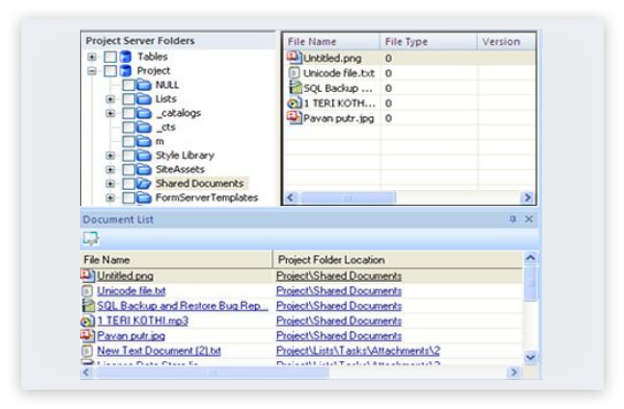 In this case Kernel for Project Server connects to the database through SQL Server or UDF file to access the data. Lepide Software Pvt. Ltd. announces the launch of Kernel for Project Server Recovery- a complete and proficient solution to recover corrupted Project Server database files. It's an effective tool designed with advance technology to fix corruption in Project Server MDF database files and retrieve entire data without failure or delay. Programmed with powerful algorithms, this utility ensures no more data loss in Project Server database due to corruption.